→ How many calories are there in a Yogurt? → Calcium: a strong point. A tiny drop. 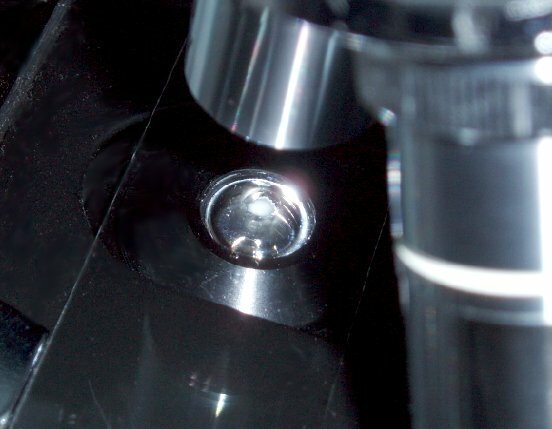 The drop has to be really small as the white solid part is too thick for microscopic inspection. 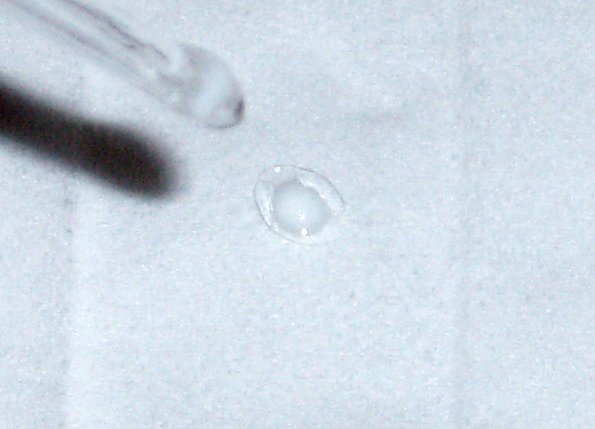 Close-up view of the drop. 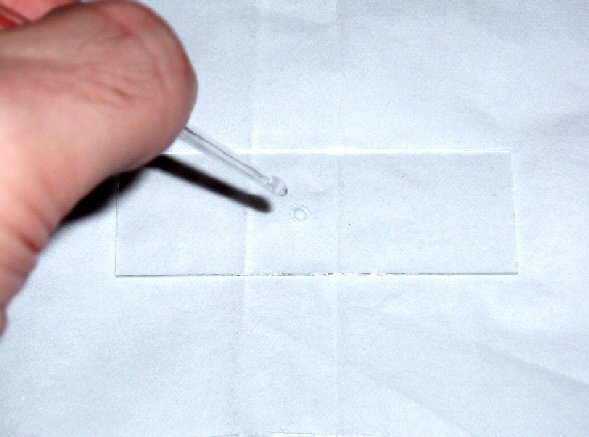 You can see the watery part and the solid part. Yogurt is curdled milk, but the involved bacteria's skills make it smooth. Under microscope. We don't squash the specimen with cover glass, as we want to get a more real feeling of the depths of the yogurt universe. Here is our island. The inhabitants are beneficial microorganisms, in other words bacteria. Their consumption is useful for the restoration of microflora in the digestive tract. When yogurt is permitted to drain, the bacteria gets dragged out of the solid like logs in rivers. So if we want to see bacteria, we need to look at the shores of the island. And if you want the health benefits of those bacteria, you should not throw away the water of yogurt. There they are. The smallest dots at the sea side. Not the medium sized chunks. Magnification 116x, from real to monitor. 400x. The exact shapes of bacteria still not visible. Need more magnification and the see-through lighting mode of the microscope. This current image is taken with moon shadow lighting. 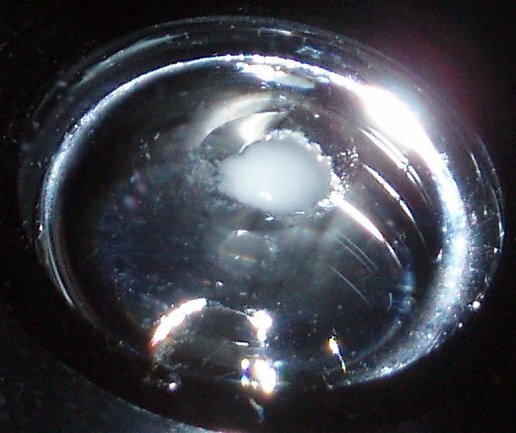 Same magnification with see through lighting. This is another spot. 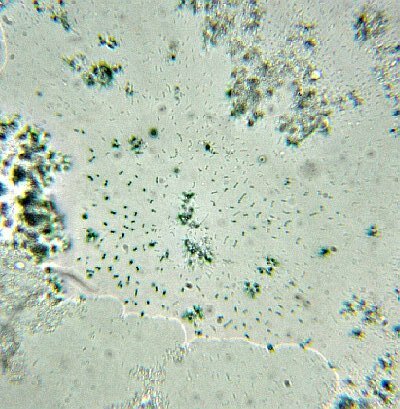 The green rods, short and long, are the bacteria. Their green color is caused by the microscope. Note: They are not always this crowded. The inevitable draining collected them here. 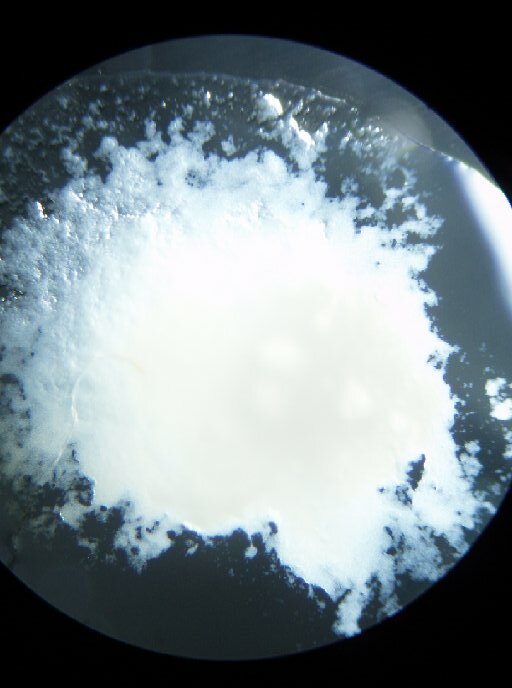 Yogurt: Milk artfully curdled by bacteria. Usually Lactobacillus acidophilus and Streptococcus thermophilus. 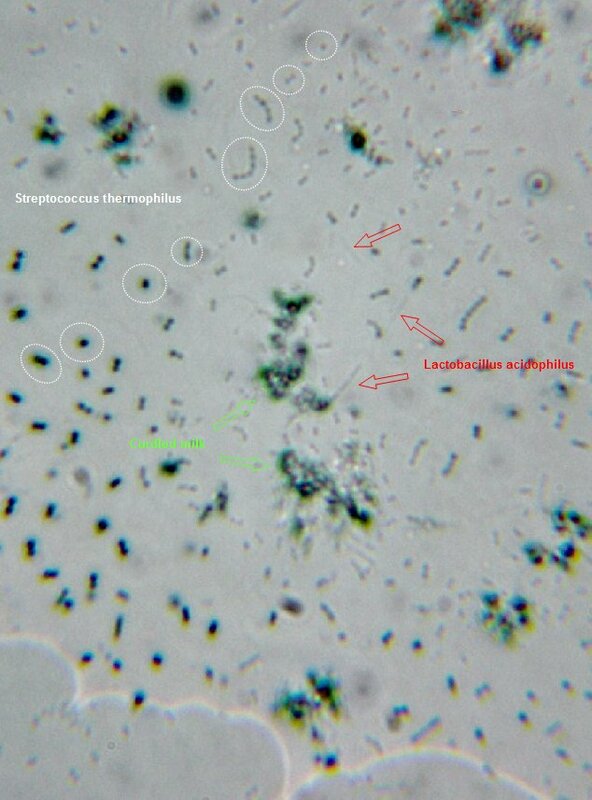 Lactobacillus acidophilus are thin, they look like a long rod or a few long connected rods. They are very few in this view. They are the bacteria people call Probiotic. Streptococcus thermophilus are round. They are usually chained. They are not Probiotic. 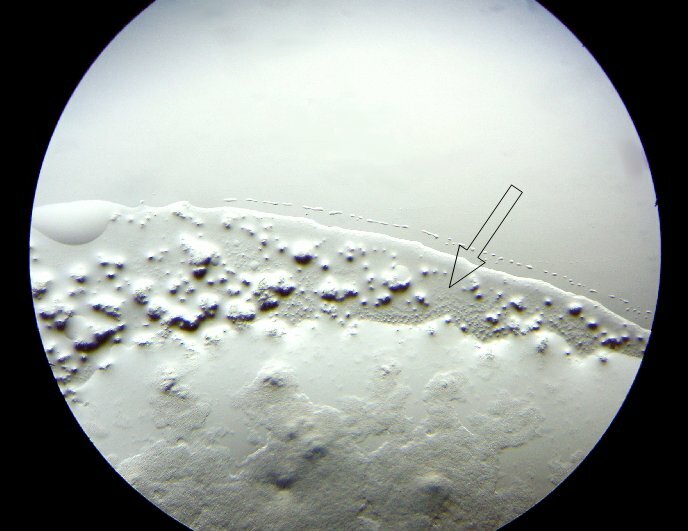 These bacteria are separated here according to size, because the liquid part was draining and the smaller bacteria were carried by the tide further than the fat ones. 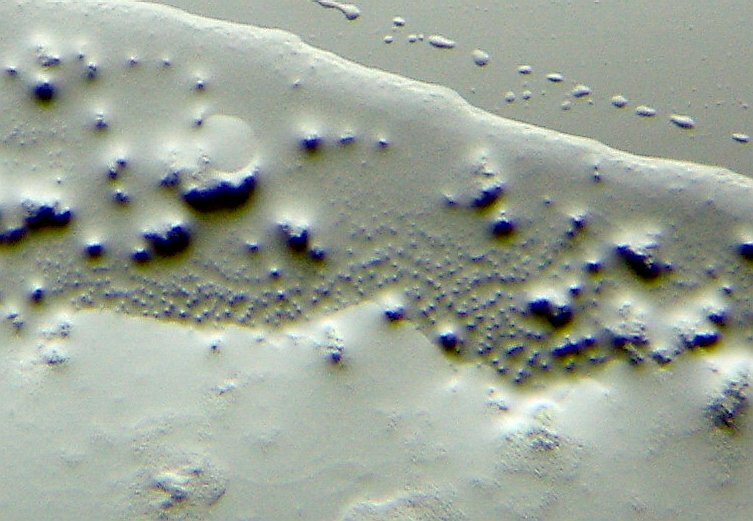 The medium sized islands about middle of image are yogurt, not bacteria. This image is 1500x against real. Plain, whole milk, 8 grams protein per 8 ounce, as usual. 100g cup (8 fl oz) container (8 oz) container (4 oz) oz. Unit weight (oz.) 3.53 oz. 8.64 oz. 8.01 oz. 3.99 oz. 1 oz. cup (8 fl oz) 245 g 8.64 oz. container (8 oz) 227 g 8.01 oz. container (4 oz) 113 g 3.99 oz.